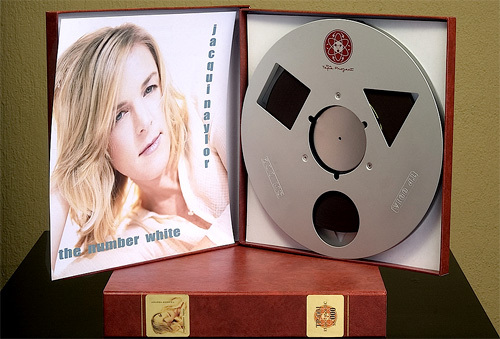 Forget CDs Or iTunes – Buy Your Music On Reel-To-Reel Tape From The Tape Project | OhGizmo! Master tapes are created on the Stubb-U-Sonic analog system in the Camellia mastering studio at the 1340 Mission studio complex. The mastering monitor system uses custom designed Magico loudspeakers and Bottlehead tube electronics. Running masters are made directly from session or mix tapes, mastered on an ATR Services 1″ two track ATR 100 with custom de Paravicini electronics, by Grammy Award winning mastering engineer Paul Stubblebine. These 1″ running masters are played on a 1″ Ampex MM1200 master tape machine conversion by ATR Services, using the legendary Ampex MR-70 tube reproduction electronics custom modified by Tim de Paravicini. Your master duplicate is recorded in real time at 15 ips in two track format on 1/4″ tape, on one of four tightly matched Ampex ATR 100s. During the duplicating process the tapes are constantly being monitored by an engineer, assuring that every tape is a perfect copy of the master. Each completed 10.5-inch reel is engraved with a catalog number indicating the A and B sides and is given a unique serial number. It’s then packaged and delivered in a leather grained setup box with gold foil embellishment and if you think all that attention to detail doesn’t come cheap, you’d be right. A subscription which includes all 10 albums currently in their catalog will set you back $2,000. There’s also a selective option that will get you any six albums for just $1,200. And don’t forget about picking up a reel-to-reel machine and a decent set of speakers in order to actually enjoy them.